In the West, sand sculpting isn’t just a beach day activity. People take it seriously, and they’ve been competing to prove their skills for decades. Here, a few of last year's memorable entries. In the West, sand sculpting isn’t just a beach day activity. People take it seriously, and they’ve been competing to prove their skills for decades. Take a look at some of the memorable entries from 2012. This contest is just one part of a weekend event with a bonfire and a Sunday morning beach run. Competitors enter on their own or in a group, and sand sculpting masters build alongside amateurs. 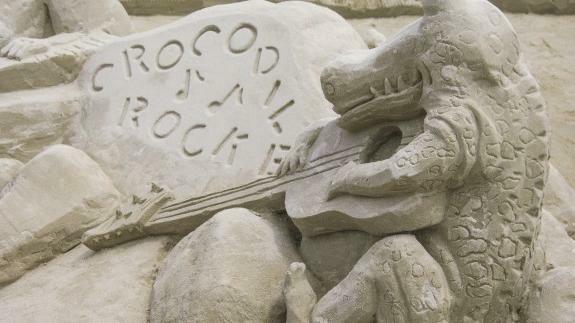 2013 was the 49th year of the contest—find photos of the winning castles here (though we’re still partial this guitar-playing crocodile built in 2012). This contest has been a tradition for 32 years at Drakes Beach inside the national park, and there’s no shortage of enthusiastic competitors and impressive entries. Thousands of spectators show up on the weekend of Labor Day to see the sculptures rise up out of the sand. Last year there were 61 entries, but only one pagoda. The U.S. Sand Sculpting Challenge & 3D Art Exposition is a newer competition, but not one to be missed. Trust us. Renowned sand sculpting masters from around the world gather on the Harbor Drive pier to do battle. The four-day extravaganza also includes live entertainment, handmade art and sand sculpture classes for kids. This is just one of the entries from last year. Build your own sand masterpiece! 5 tips from Todd Vander Pluym, winner of nearly 200 sand-sculpting competitions.